At a recent dinner party in Harlem, I was drawn to an early work by renowned artist and activist, Faith Ringgold. 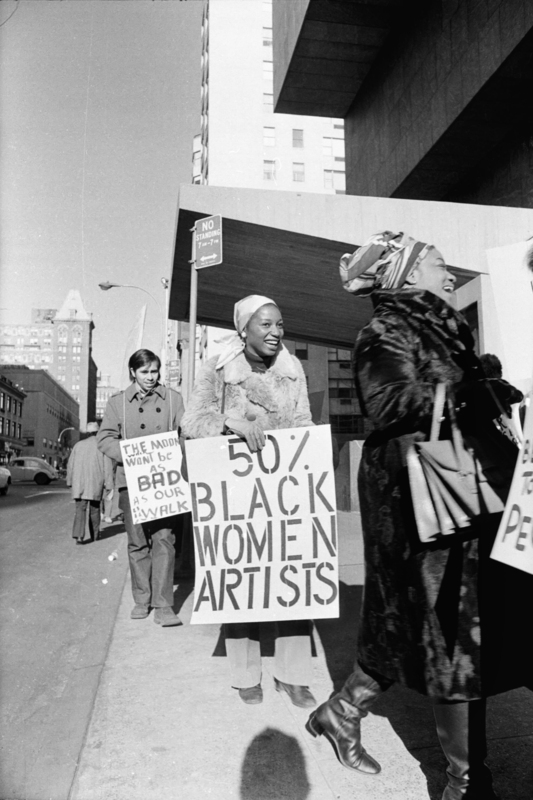 Born in this very village, as so many other extraordinary visual and performing African American artists, Ringgold is also widely acclaimed as a civil rights activist and pioneer in the direct involvement of black women on issues of gender equality. During the ensuing years Ringgold’s art earned recognition and critical praise. Her collections are included in The Metropolitan Museum of Art, The National Museum of American Art, MoMA, The Solomon R. Guggenheim Museum and The Museum of Fine Arts Boston (MFA). At that Harlem gathering in the home of an art collector, I engaged in a tête-à-tête with my dinner partner over memories of my days as a curator-in-training at The Museum of Fine Arts Boston/Museum of the National Center of Afro-American Artists, in Boston. We organized the very group exhibit at the MFA that led to the acquisition of one of Ringgold’s soft sculptures. The Division for Gender Equality in the Office of the Director-General at UNESCO Paris is headed by Director Saniye Gülser Corat, a seasoned champion of women’s rights worldwide with a history of dedicated service to women and girls, and men and boys in underdeveloped countries. The globally embraced “International Women’s Day” is a primary initiative of Director Corat’s Division. 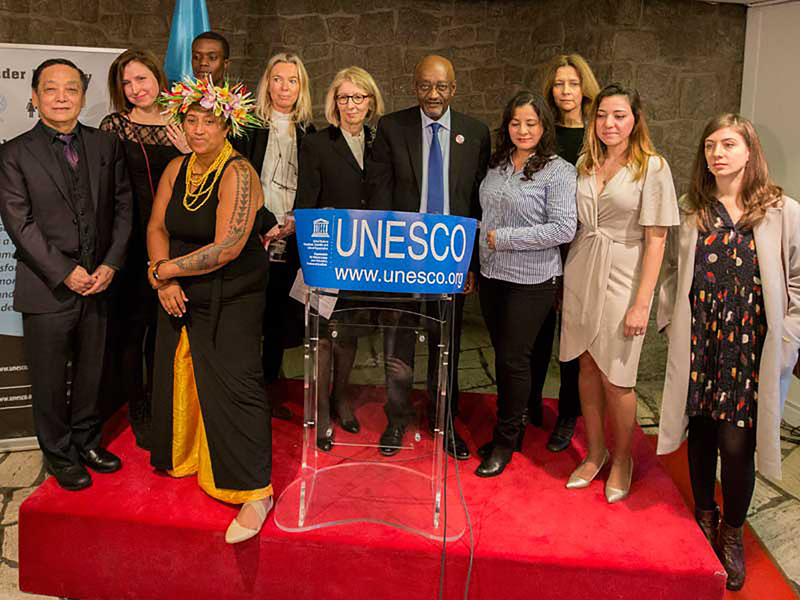 While simultaneous celebrations are staged globally, the focus of UNESCO Paris was “Women and Art”. From March 8 to March 17, representatives of member states convened to participate in events that included a roundtable discussion of experts in the field, dance and music performances, and a visual arts exhibition. HT: Let’s begin by asking you to provide context for the International Women’s Day 2017 by giving a brief background on UNESCO. UNESCO: UNESCO is a United Nations agency established in 1945, with 5 areas of competence from education to culture: natural sciences, social and human sciences, communications and information. Gender Equality and Women’s Empowerment was designated as a global priority. Currently there are two for all of UNESCO: Gender Equality and Women’s Empowerment, and Africa, which is more about the continent and a geographical grouping. From a schematic perspective there is only one global priority which is gender equality because it also applies to Africa. What this means is that we look at all our programs from the 5 areas of competence, and all programs and initiatives through a gender equality perspective. We use a gender equality lens with a view to ensure that girls and boys, women and men fully and equally enjoy their rights and benefit from equal opportunities. UNESCO is the first UN agency which took gender equality on board as a very serious matter. That happened in 2007. Since then we have had gender equality as the guiding light or the common thread for all our programs. Every year we organize a comprehensive program to mark International Women’s Day and organize a number of intellectual events and also cultural events, as the only UN agency that has culture as one of the areas of competence. 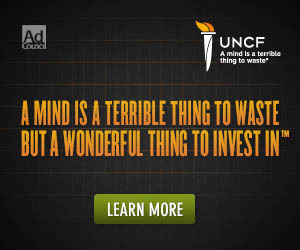 We have that niche and use it to the extent possible. HT: Why was this year’s focus “Women and Art”? UNESCO: This year the UN adopted another initiative for International Women’s Day, which was Women in the Labor Market and Economic Empowerment. However, we thought what we could bring to the debate that would be unique is to look at women’s role and participation in the arts and cultural industries. So we organized a program around that with a Roundtable on “The Courage to Create”, an Exhibition with the participation of 12 artists from different countries around the world identified by member states of UNESCO, and a concert with the participation of the UN. We also had a discussion with around 400 high school students who came from different schools in and around Paris and a number of UNESCO officials who had English dialogue with them and talked about gender equality and women’s empowerment and the arts. For the overall program in Paris we collaborated with the national committee for France for UN women. UN women is another agency with national committees in different countries which are composed of not only UN officials but people from countries that are interested in helping UN Women raise funds. I am referring to the UNICEF committees in different countries; we collaborated with the French committee who was able to bring some of their artists. HT: The Roundtable was an occasion to initiate dialogue between policy makers and the artists and activists. How successful was that session? UNESCO: The Roundtable was quite a successful event. The panelists were leaders in their communities and societies who use artistic expressions to encourage social change. The idea behind the Roundtable is that we know UNESCO’s work in different areas, that gender stereotypes are very strong and the cultural industries in the arts is no exception. Therefore, most of our speakers were young women who have proved their excellence, and we feel they provided the much needed role models for the new generations that also want to fully participate in the arts and make use of the power of artistic expression through social change. The Roundtable truly represented a powerful moment of dialogue and experience sharing between the different artists and activists. And, the profile of the participants also demonstrated that artistic expression and innovation is not a prerogative of the global north but that young activists and artists from emerging economies have also a lot of courage and power to create in the field of art and contribute to the promotion of gender equality. Our hope is that this conversation will continue throughout UNESCO’s 2017 celebrations. HT: Did the Roundtable discussions culminate in solutions to be put in place for the long term? UNESCO: For International Women’s Day we did not really put forward a document or a call for solutions. It was more about starting the dialogue with the idea that the dialogue would continue either through UNESCO channels or through other networks. So we haven’t really had a chance to sit down and think where we would go from here as the next step, but will when I return to UNESCO Paris. It will be the first item on our agenda. HT: The general theme of the visual art exhibition was “creativity of young women in shaping our future”. What was the artist selection process and how many countries were represented? In Harlem, the artist Faith Ringgold had the insight and determination to transform policy and practice for gender equality in the art world. 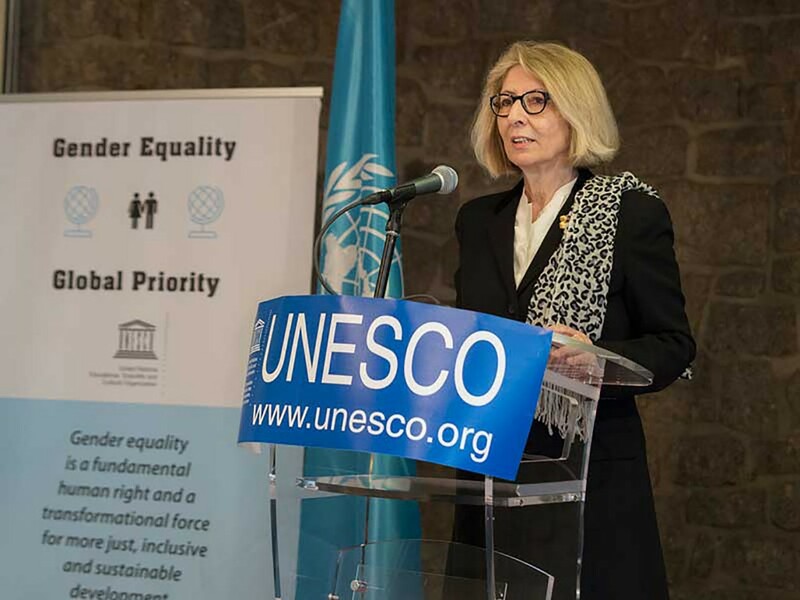 The ongoing initiatives of UNESCO’s Division for Gender Equality will continue to bring together women and girls, men and boys, globally, to further activities established by their predecessors of the past four decades.